WASHINGTON, D.C. -- Americans' optimism about the climate for buying a home has waned somewhat from recent years. By a slim margin, optimism sits at its lowest level since 2008. Sixty-six percent of Americans say now is a good time to buy a home, down slightly from an average of 71% between 2009 and 2015. 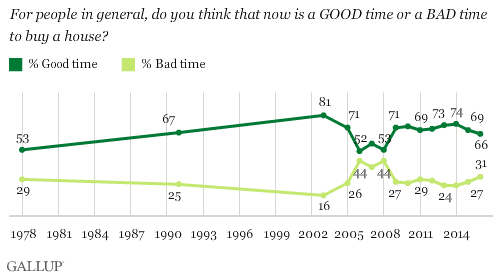 Still, these views are much more positive than what Gallup measured from 2006 to 2008 amid the housing bubble crisis, when an average of 54% of U.S. adults said it was a good time to buy a home. 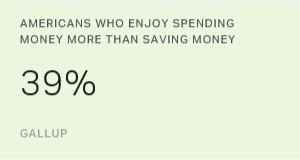 The latest results are based on Gallup's annual Economy and Personal Finance survey, conducted April 6-10. 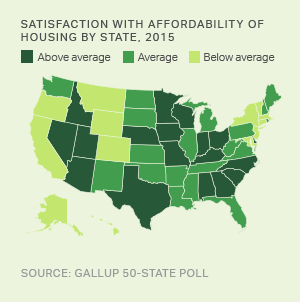 Americans' less optimistic views about the homebuying climate may be related to rising housing prices in many parts of the country, partly caused by a low supply of new and existing homes. 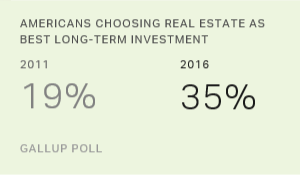 Americans may also be factoring in their views of the investment returns on buying a house, although in the same poll, they chose real estate as a better long-term investment than stocks or other investments. That the percentage saying it is a good time to buy a home has never dropped below 50%, even after the housing bubble burst, indicates that people's perceptions reflect not only prevailing housing market conditions, but also their views about the value of homeownership in general. Regionally, Americans living in the Midwest and South are the most optimistic that now is a good time to buy a home, while those in the West are the least positive. Those aged 50 to 64 are more positive than other age groups. Upper- and middle-income Americans' views are more optimistic than those of lower-income Americans, who likely have more difficulty affording houses. Current homeowners are significantly more upbeat than renters about it being a good time to buy a house, a change from 2005, when views were similar among both groups. To a large degree, this wider gap in homeowners' and renters' views may reflect their own attitudes about owning a home in general, regardless of market conditions. Some renters may prefer renting and be less likely to endorse buying a home, given their own situation. With home values peaking during the housing bubble, renters may have seen the great potential in owning a home. But after the bubble burst, and home values dropped precipitously, it was probably harder for renters to see the financial virtues of owning a home. 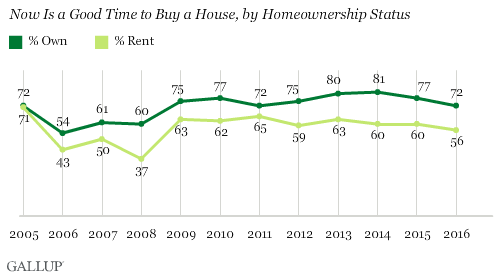 Gallup's trends show a significant drop in homeownership compared with the mid-2000s, from 73% in 2007 to 62% today. Likely reflecting recent increases in home values, a majority of U.S. adults predict housing prices in their local area will increase over the next year. Currently, 55% say housing prices will increase; 31% say they will stay the same; and 12% say they will decrease. These predictions are slightly less optimistic than last year, but similar to views found two years ago. From 2008 to 2011, Americans were generally more likely to say local housing prices would decrease or stay the same than to say they would increase. As housing prices began to rise in 2012, Americans' predictions for local housing prices grew more optimistic. By 2013, Americans' views of increased housing values in their local area had jumped. They have stayed relatively high since. But the percentage saying housing prices will increase has not yet recovered to the levels seen in 2005 and early 2006, before the housing bubble burst. Americans living in the West (64%) and South (61%) are significantly more likely than those in the East (48%) and Midwest (45%) to say they expect local housing prices to increase. Regardless of views of the housing market, the majority of nonhomeowners continue to say they intend to buy a home in the foreseeable future. Currently, 59% of nonhomeowners think they will buy a home at some point within the next 10 years. This is down slightly from 67% in 2013, but similar to the 58% recorded in 2015. Of course, it is unlikely that all those who say they plan to buy a home will actually do so, but these figures indicate the extent to which homeownership is still a desirable goal for many Americans. Based on what you know right now, do you think you will buy a home in the next year, in the next five years, in the next 10 years, or are you unlikely to buy a home in the forseeable future? Although economic confidence is higher now than at most points in recent years and mortgage rates remain low, Americans are a bit less positive about the homebuying climate than they have been since 2009. Americans' belief that home prices in their area are on the rise, coupled with reports indicating there is a lack of inventory of available homes in many areas, may leave many with the sense that market conditions currently favor sellers over buyers. Still, the majority of nonhomeowners say they think they will buy a home in the future, and Americans continue to say real estate is the best long-term investment. But rising home prices, growing student debt burden, delayed marriage and childbearing, and worries about the state of the economy could result in more nonhomeowners delaying or forgoing a house. Young adults -- the least likely across age groups to say real estate is the best long-term investment -- may be reluctant to make a house their single most valuable asset after witnessing the housing market collapse. But rising rents, which make owning less expensive than renting in many areas, might nudge Americans toward homeownership. Results for this Gallup poll are based on telephone interviews conducted April 6-10, 2016, with a random sample of 1,015 adults, aged 18 and older, living in all 50 U.S. states and the District of Columbia. For results based on the total sample of national adults, the margin of sampling error is ±4 percentage points at the 95% confidence level. For results based on the total sample of 687 homeowners, the margin of sampling error is ±5 percentage points at the 95% confidence level. All reported margins of sampling error include computed design effects for weighting. U.S. renters are nearly twice as likely as homeowners to say they worry about not being able to pay their housing costs, 49% to 25%. Renters at all income levels worry more than homeowners.